For those who may remember, at the beginning of the year I gave out a couple of fun assignments. My goal was to do one every month but life got in the way and I had to attend to other matters. Well, for this month and next, I am going to bring the assignments back. I hope you all jump back in and have some fun with them. The water in Lake George is considered some of the cleanest in the world. As in the first assignments, do not send me your photos. What I would like you to do is post them on your blog, flickr or other photo sharing site, personal website or any other place on the Internet where you can place a link to it here by making a comment to this blog entry. Then we can visit those sites and enjoy all the great water photography. Please, have your photos posted by Wednesday, October 21, 2009. Don’t have a place to post? Might be a good time to start up a blog or join a photo community like flickr or Exposure. As I did for Assignments 1 and 2, I’ll put together a recap with my comments. 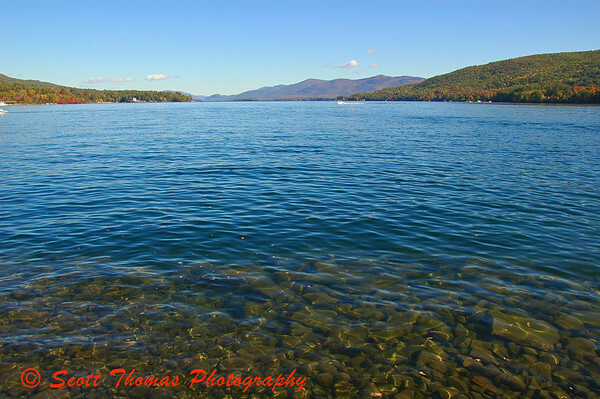 This entry was posted in Assignments and tagged adirondacks, lake, lake george, new york, Photography, water. Bookmark the permalink. The water is so very clear and beautiful. Gorgeous. Well, I don’t know if I qualify. I’ve already taken a good number of lake photos recently and I’ve been posting these with more to come. I love water photos of many kinds…. realistic and abstract. Thank you, Anna! I had read where Lake George was one of the cleanest lakes and looked for a way to show that in a photo. Please do show us something you and/or Preston have done with water. Beautiful image and scene Scott, nicely done !! Here is my post, I had a chance to visit Laos in November 2008 and saw the two colors river. Oh, people, you have got to check this out. Never saw anything like this. Another lovely mountain waterfall. Must be the time of year for some great fall waterfall photography and this is an excellent example, Jason. Water? On Torch Lake Views? Hmmm. OK.
Sure now? :> Ah, Gerry, you’ve told us a lovely story of what can be found just under the surface of water. Thank you! I love to take photographs. That being said, I have a lot to learn too. I started a blog in April of this year after reading so many of the ‘mommy blogs’ out there. My kids are older, and I didn’t think I had a whole lot to add, but perhaps I could use it as a way to connect with others learning the art of photography and learn a few things along the way as well. I am linking to one of my favorite water shots. Very emotional one for me. I posted it back in April when I first started blogging. It might be one of my biggest downfalls as a photographer. I get too attached to the meaning/reason/memory of the subject of the picture instead of looking at the technical aspects of it. Oh, my, gosh, Valerie. Thank you for sharing. It’s a beautiful tribute and a touching photo of how nature can affect us deeply and help heal us through tragedy. Hopefully it still qualifies, even though not every picture has water in it. Yep, it qualifies and shows us the power water can inflict on us humans. Thank you for making this new assignment, its fun to join. Brigitte, you shown us the importance of water and it’s bodies in the evolution of your country. Thank you! Another of the Torch Lake Irregulars has weighed in, but I’m saving it for Tuesday. Maybe I’ll get some more, who knows–link(s) to follow. Having fun following links, though. Shades of Norman McLean in Montana. Icy dippers weeping in New York. The very definition of really wet water. A Two Colors River – who knew? Well, lots of people I’m sure, but I didn’t. Now I do. And comparing views of Lake George . . . a person can never look at Lake George too many times. The world’s life-giving water. Don’t mess with it. I mean it. Thanks, Gerry! Hey, when you get time could you post the links to those additional Torch Lake Irregular photos? Ah. I thought the ping would do it. Here you go. Thank you Scott for another challenge. My contribution is a couple of images from ‘The golden city’ Prague. Carsten has not only showed us the relationship between the Sun and water but the stillness of an old European city. Make sure you check out both posts everyone. I’m attracted by the power of water to be both transparent and at the same time reflecting. YB…got a post you can add here? Would love to see it. No problem, Anna. Lovely work as always. Thanks! Water is life as your photo shows us. Whenever the weather is not cooperating, I will seek out flowing water! After college, I did an internship at Olympic National Park and remember fondly the temperate rain forests in the park which your photos remind me of. Lush and vivid greens and the feel of moisture in the air all around. Sorry! I’m a bit behind over here, and can’t wait to look through everyone’s submissions! I like the Prospect Mountain shots and, yeah, colors look drab compared to last year’s. Sure makes me appreciate it that much more. The water droplet shots are way cool. Hope all that work helped to get through the nights. I still say that’s a cutout. 🙂 Like how you froze the action at it’s peak moment. And join she did, literally, with this interesting self-portrait. Tell her she did good!